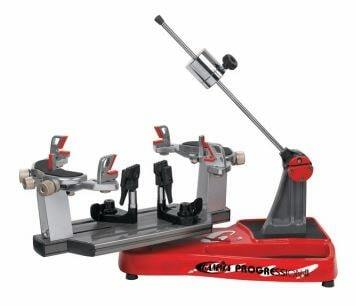 The Gamma X-6FC tennis stringing machine is a fixed clamp, drop weight, 6 point quick mount stringing machine. The drop weight tensioning mechanism (9 to 90 lbs / 4 to 41 kgs) provides accurate tensioning. It’s more accurate than a winder stringing machine. The Gamma X-6FC tennis stringing machine (Click Here to get it at a good price) uses a diamond coated rotational ratchet gripper to hold the string in place while it is being tensioned. The string is placed between the grippers and the tension in the string provides the clamping force to the jaws. 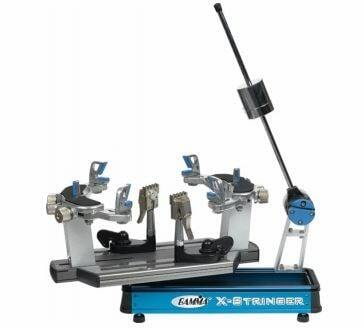 The advantage of the Gamma X-6FC stringing machine over the Gamma X-6 is mainly in the fixed clamps. The Gamma X-6FC uses fixed clamps that retain the tension in the string better than floating clamps which require you to clamp two strings at a time to maintain proper string tension. When deciding on the right tennis stringing machine you should be mindful that it is not possible to upgrade a floating clamp stringing machine later to become a fixed clamp stringing machine. This is because the type of clamping used is integral to each tennis stringing machine and its structure. The Gamma X-6FC uses metal diamond coated clamps with the Gamma self-locking adjustment knob to hold strings with less clamping pressure on the actual string. The diamond coating provides increased friction between the clamp and the string to allow for reduced pressure on the string while still holding the string in place under tension. What are the advantages of these clamps? The fixed clamps for the Gamma X-6FC stringing machine are a dual action design whereby the clamp which holds the string operates independently from the base of the clamp. The Gamma X-6FC utilizes quick action swivel clamp bases. The advantage of this dual action clamp is that it is relatively maintenance free, whereas, the single action swivel clamps have problems with the brake assembly which requires regular maintenance servicing. In addition to a tool tray, the Gamma X-6FC tennis stringing machine includes a built in storage drawer located in the base. The drawer is secured with a spring loaded latch which is easy to open and it automatically locks back into place when you close the drawer. This is very handy for storing tools like pliers, awls, cutter etc. If you are going to move your tennis stringing machine around (even just from room to room) then you will want to secure your tools. Therefore having the drawer located in the base of the stringing machine is ideal. Can I get a cover for the Gamma X-6FC? Yes, you get a cover for this tennis stringing machine. It doesn’t come with one. 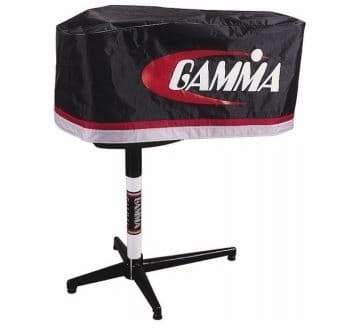 It’s wise to purchase the Gamma cover when you’re buying your stringing machine to save it from dust and grime. If you have to clean the dust out of hard to reach places it gets frustrating. Take a look at the Gamma Cover here (you can see more details and the price). I don’t know if dust accumulation affects the diamond coated ratchet gripper or the clamps but I’m guessing it might. The Gamma X-6FC doesn’t come with a stand. Yes, you can buy a stand separately. This stringing machine is a table top model. But if you’re using it often or you prefer that it doesn’t always hog the table space, you’re better off getting the stand. 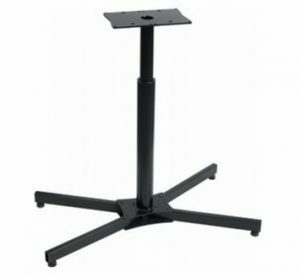 The stand is sturdy and adjustable in height. 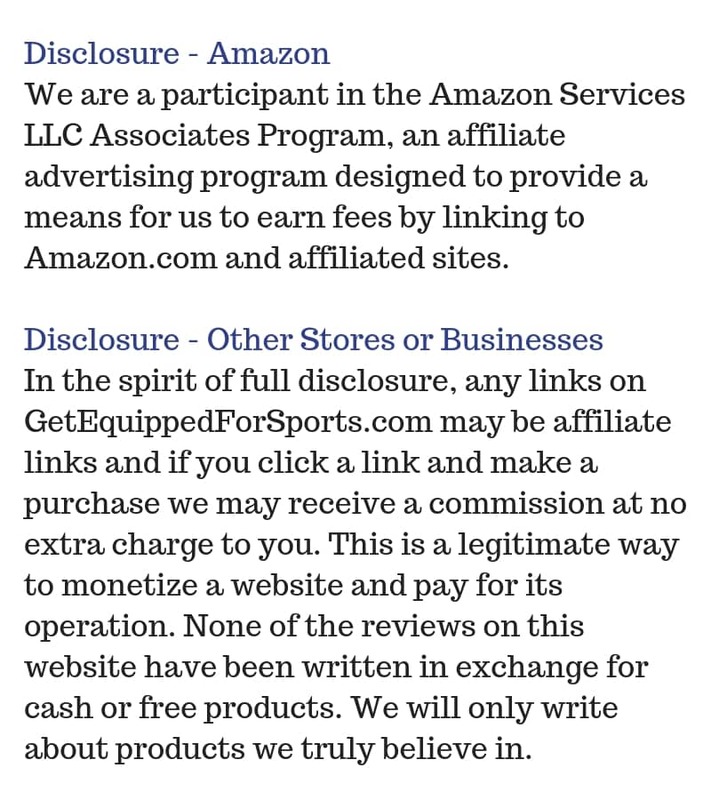 To see more details, including the price, Click Here. The stand gives you a lot more options for where to place it in your home. By using a stand you don’t need a large table under your stringer taking up heaps of room in your house. You’ll also find it easy standing at the stringer without a table because you can position your feet better. You also get better access for you arms/hands/elbows while you’re stringing. The Gamma Progression II 602FC tennis stringing machine is very similar to the Gamma X-6FC (see above). However, it only offers a tool tray and not the drawer as well. For most people the advantage of having the drawer is well worth getting. 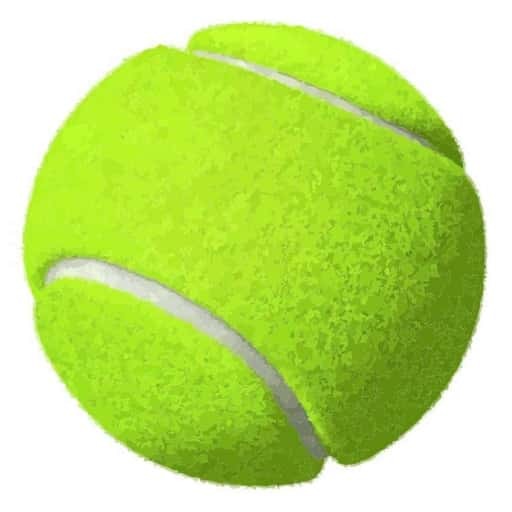 However, if you are unlikely to move your tennis stringing machine around much and you prefer the red color of the base then definitely buy the Gamma Progression II 602FC. The Gamma Progression II 602FC tennis stringing machine is a high quality stringing machine which is easy to use and provides accurate tension throughout the string bed. This is as a result of its drop weight mechanism, its fixed clamps and its diamond coated rotational ratchet gripper. You can read about the advantages of these features in the Gamma X-6FC tennis stringing machine review above. Both the Gamma X-6FC and the Gamma Progression II 602FC are superior drop weight machines. They provide you with the accuracy you need. They are easy to use once you have a little experience with a drop weight system. And the fixed clamps are superior dual action clamps with self-locking adjustment knobs. You’ll notice the high quality of these Gamma tennis stringing machines compared to other brands of drop weight stringers. ⇒ Looking for a Spring Tension Winder machine? Want the next level up in tennis stringing machine? See more here.